Pimples. It’s not even a nice word. Popcorn. That’s a much nicer word. 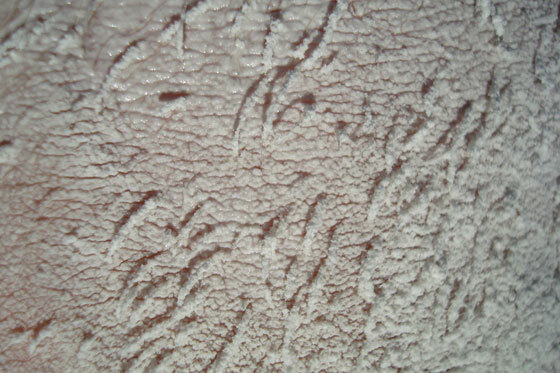 Stippled ceilings have come to be known as popcorn ceilings. However, in my opinion, popcorn is much too nice of a word to be associated with these ugly ceilings. Not to trigger any traumatic teenage flashbacks, but stippled ceilings are closer to pimples than popcorn. 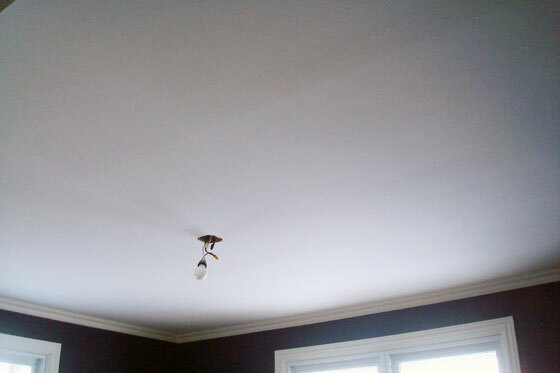 Step one in the master bedroom makeover was to help the ceiling grow up from its ugly adolescence into beautiful adulthood–and I couldn’t just make like a fashion magazine and airbrush. It was gonna take muscle, and it was gonna be messy. 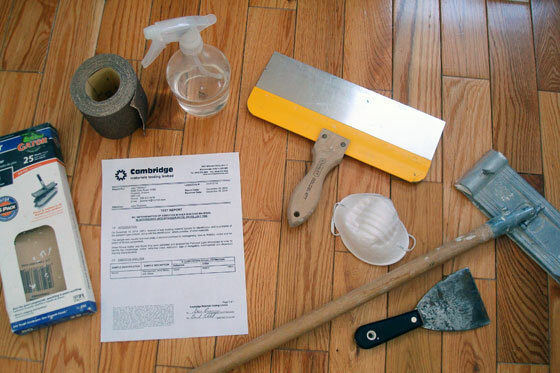 So, armed with an all-clear on my asbestos test, trowels, a spray bottle of water, pole sander, extra sandpaper and a dust mask, I went to work. In the basement where we also had stipple ceiling, I actually sanded a lot of it off. This technique gave me a really nice smooth finish, even if it did generate a tonne of dust. In the bedroom, I found soaking in water and then scraping with the trowel worked best. As much as the big yellow trowel would have been faster, I liked the control of my little trowel. It was still a lot of work. 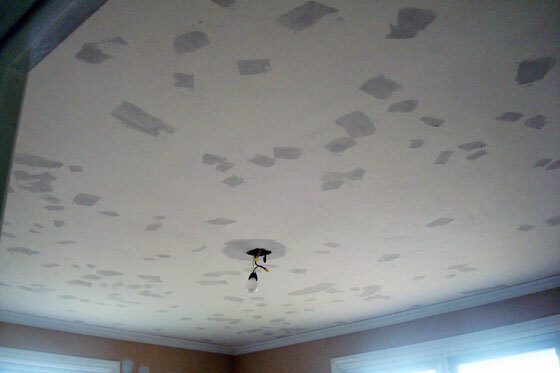 Scraping a stipple ceiling is not fun. However, fueled by ju-jubes, I got it done. (My skin may have progressed from its teenage years, but my diet has not. The orange ones are still my favourite). 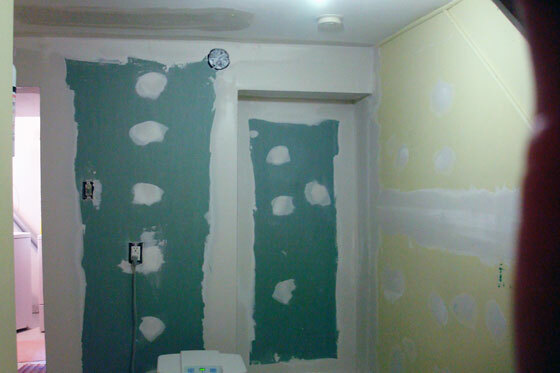 Underneath the stipple, the drywall was smooth and painted, which leads me to ask why? Why finish a ceiling smooth, paint it and then cover it in pimples? I just don’t understand. We all know the prep work is most important to get a good paint job. I spent more time on prep for the bedroom than I ever have before. Scraping the ceiling, scraping the caulking from between the crown molding and the ceiling (ugh), patching hundreds of little chips in the ceiling (they were just minor chips of paint, but there were truly hundreds of them), patching one bad ceiling seam and one crack in the wall, sanding and pasting over again. Thank goodness I was off work for the Christmas break. Although it wasn’t the most restful holiday. In the end though, my ceiling is all grown up and pimple-free. Much nicer to look at when I’m lying in bed in my new master bedroom. (Apologies for the really bad photo, but I think you can tell it’s nice and smooth. Oh, and there’s a sneak peak of the blue walls). Have you ever scraped a stipple ceiling? Any techniques to share? Any insights on why people stipple ceilings? And most important, what colour ju-jubes are your favourite? You know those things that you have to do, want to do, but don’t really want to do? That’s this month’s project. The plan is to start our master bedroom makeover. Step one is remove the popcorn ceiling (the fan’s on the list too). I’ve been saving this project until I could open the windows, as there is likely to be a bit of dust and mess. What are you up to this July? 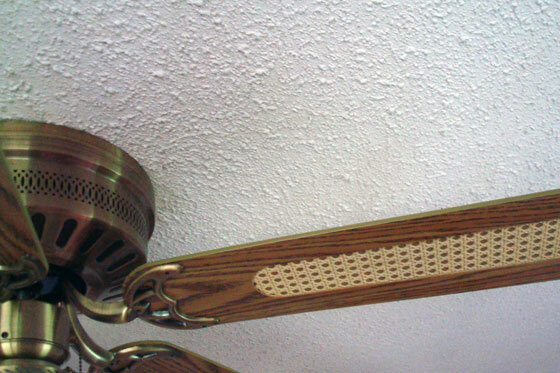 Do you have any tips for removing stippled ceilings? 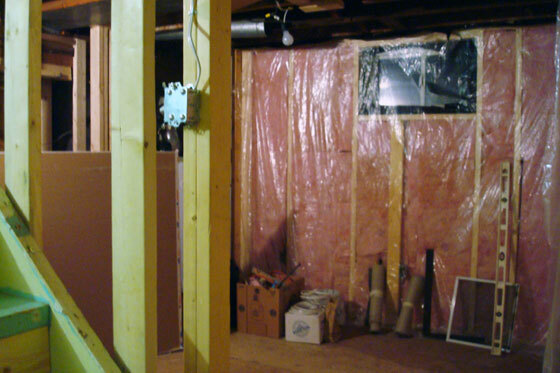 In the basement, I scraped some and sanded others. Sanding’s way messier, but I got a nice smooth finish and had to do less patching. 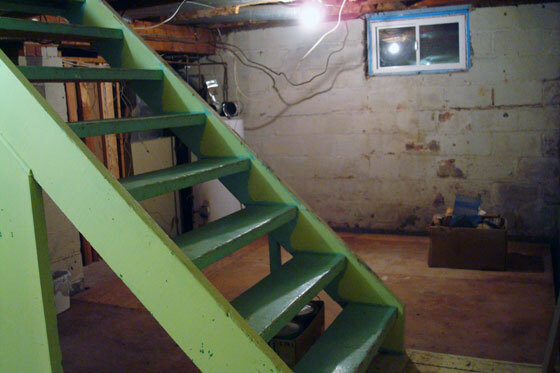 On the quest to renovate the basement at our first house, Matt and I dove in with our characteristic “go big” approach. 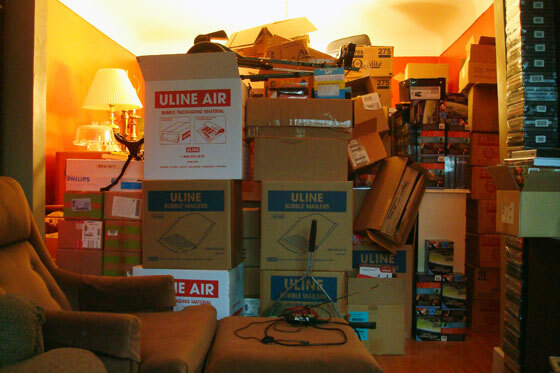 Everything that was in the basement came upstairs and was stacked in the dining, living and bed rooms making for a lovely “Hoarders” atmosphere. Downstairs, just like we would do a year later at the farm, we went back to the concrete. 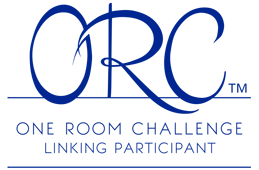 Buh-bye blue room. And farewell weird shelving area. We reframed. We rewired. We reinsulated. We drywalled. Lots of drywall, although not as much as last summer. Lots of taping. Lots of pasting. We laid new flooring, and we painted. 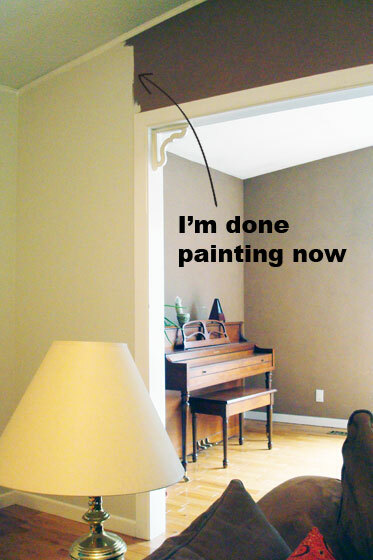 We installed new trim, new shelving, new closet rods and doors. Curious how it all turned out? Were we able to banish the dungeon? Tune in next for the reveal. We are calling it on the drywall phase of the basement reno. Five and a half months–in case the text version wasn’t clear, let me translate that into numerals 5 1/2 (or 5.5 for you digitally minded folks) months–after we started drywalling the basement, we are finally finished. Oh the glamourous life of DIYers. 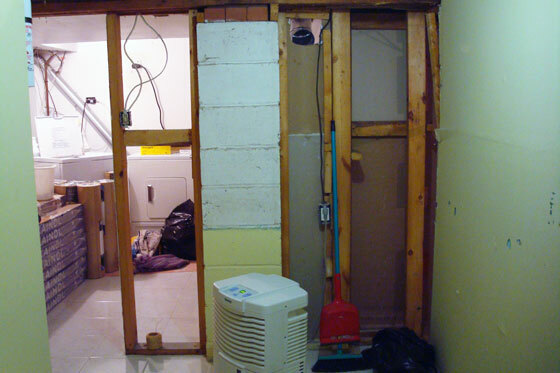 Lest there’s any additional lack of clarity, the basement reno itself is not finished. Only the drywall stage is done. Bandaging my fingers for my evening sanding sessions. 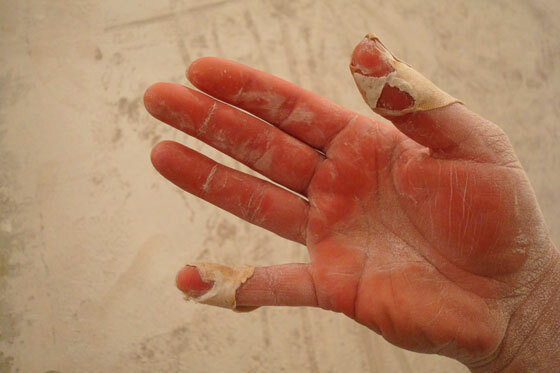 This is what my hands looked like at the end of a night of sanding. The bandages are pretty much worn away. I built up calluses on my fingers, of course, but calluses can only do so much. It took me two nights of bleeding fingers to learn my lesson. (Point in my favour: the nights were not consecutive. I’m not that dumb). Before the second incident, I thought my fingers were sufficiently toughened from the first incident to not require protection. I learned that no matter how leathery and rough I think my hands are, I can apparently always do more damage. Good news is I would make a good spy these days, as my fingerprints are sanded off. 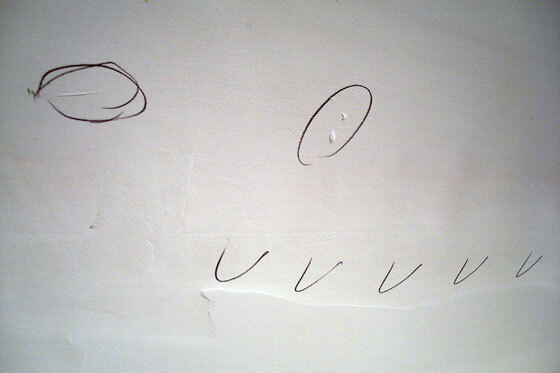 Also done is Matt’s nightly decoding dilemmas as he tries to interpret the pasting instructions I draw on the drywall. The two circles highlight a scratch and some divots that need to be filled. The U and V markings are supposed to be arrows that point out a ridge that needs to be feathered out with paste. 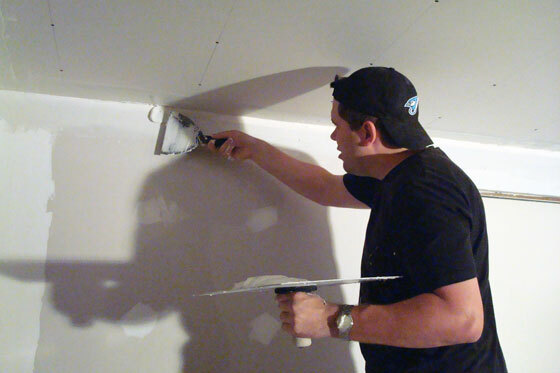 The division of labour when it came to drywall was I sand, Matt pastes. As I work, I keep a pencil behind my ear, so that I can mark spots that need particular attention. Additional symbols in my drywall lexicon include lines and once in awhile actual words–that usually still require translation. 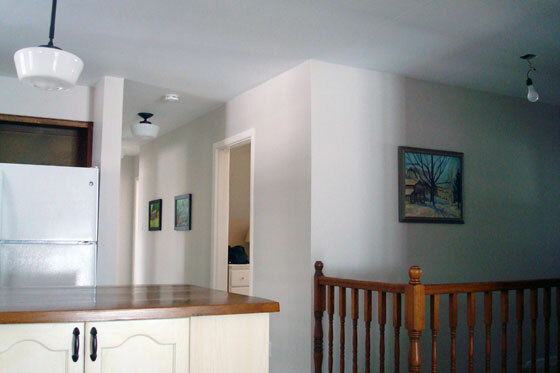 The biggest change that will result from concluding drywall work will be no more drywall dust throughout the house. 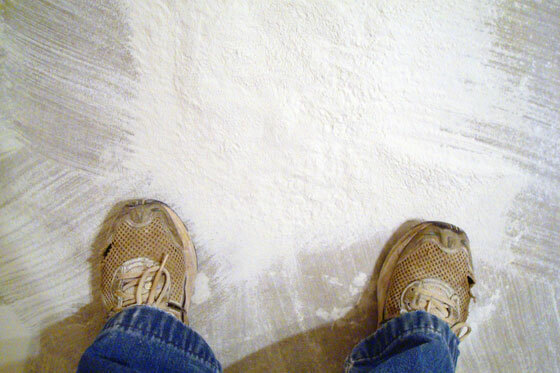 The partially swept office floor (and yes, I know my work shoes are looking a little worn). In the basement, the dust was so deep that dunes were starting to form. It took Matt and me a full afternoon to wipe down the walls and ceilings, sweep up the worst of the dust and then vacuum the remaining powder. Upstairs is also covered in a fine skim of dust, although we haven’t done a deep clean there yet. 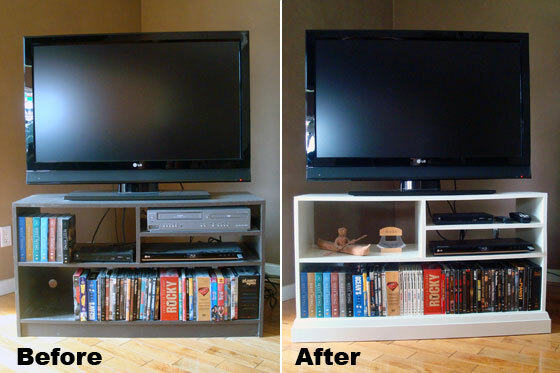 We have to keep up our glamourous DIY lifestyle, after all. Starting out on this project, I never dreamed that drywall would take us nearly half a year (ouch, that sounds like a really, really long time). 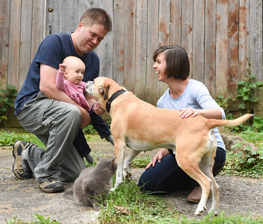 My only excuse is that we ended up having to redo a huge area–pretty much the whole basement, we didn’t work on it religiously every single day and we’re not professional, so we’re slow. The finish is definitely not perfect, but I’m satisfied with how it turned out, and I’m really happy that Matt and I were able to tackle such a big project together by ourselves (with help from my Dad, of course. Thanks, Dad!). And now, in the way of DIY, concluding one stage of the project means it’s now on to the next. Painting here we come! Matt and I put on a push this week in the basement in an attempt to pick up the pace on the pasting. (I love alliteration, but that’s a lot of ‘p’s even for me). We’ve made a lot of progress, but a side effect of all of this productivity (I just can’t stop!) is that we are both suffering from hod claw. 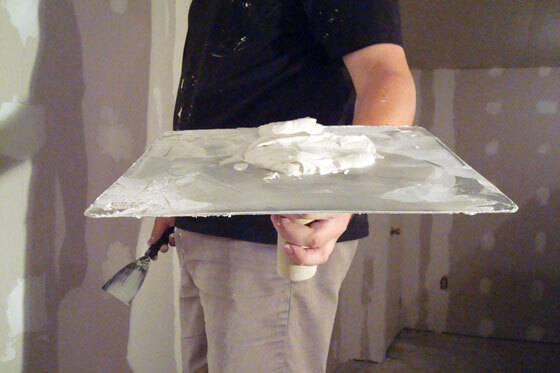 For those that haven’t had the pleasure, a hod is basically a big tray that holds the drywall paste (also known as mud or compound) while you’re working. After a full evening of working in the basement, uncurling our fingers from our hods is harder than you’d think. It’s not that we love drywall and don’t want to stop. The issue is that our hands have seized around the handle of the hod and returning them to their regular dexterity requires much flexing and massaging. 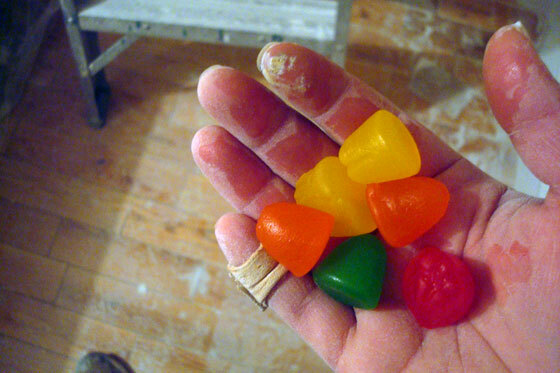 When it comes to drywall, there are a variety of tools people choose to hold their paste. Some work directly from a bucket. Others use a mudpan. I grew up using a hod, so that’s what we use now. Once I cross the three hour mark of pasting, I don’t think it matters what’s holding my paste. At that point, my hands have cramped. As long as I keep working, I don’t feel it too much. As soon as I set the hod down, though, that’s when I realize how tired my hands are. Fortunately, by the next morning, I’ve usually regained most of my range of motion. Even more fortunately, thanks to our concentrated efforts this week, we’re nearing the end on this pasting odyssey and will soon be setting down our hods. Hopefully, our hands recover from their case of hod claw shortly thereafter. 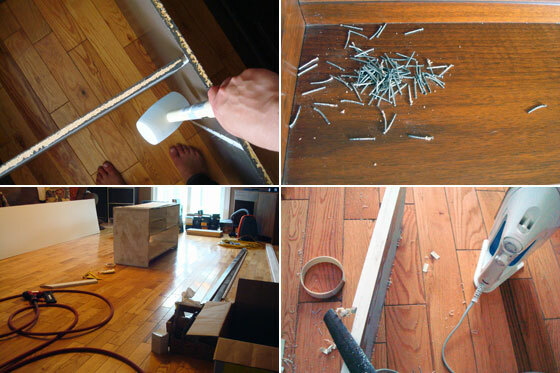 Any other DIYers out there who use a hod for drywalling? Have you ever been afflicted with hod claw? Or do you have your own unique DIY injuries? If you zoomed out on Friday’s photo, you would have seen something like this. No, we did not have a baking accident and we’re not 18th century aficionados who powder our hair and faces. We’re renovators and these days drywall is on the top of the to do list. Actually, it’s probably more the “please can we just get this done already” list, but I’m trying not to sound too desperate. Skin and arm hair with a heavy dusting of drywall. Yum. 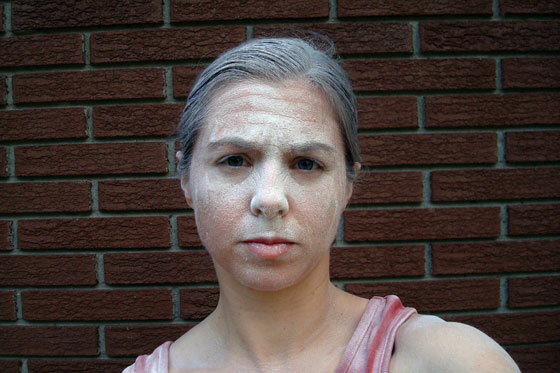 The sanding stage of drywall installation is usually the time I start to reconsider my affection for DIY renovations. This is a lot of work, and sanding drywall is really not fun work. Pretty much every single surface in the basement has new drywall or at least a patch of some kind. That means I’m sanding more than I’ve ever sanded in my life. My arm muscles are toned like they’ve never been before, but my nails and fingertips are rubbed off in some places. Ow. And I’m sure the amount of dust that has entered my body through my nose, eyes and mouth can’t be healthy. We’re not pros, so we’re slow. 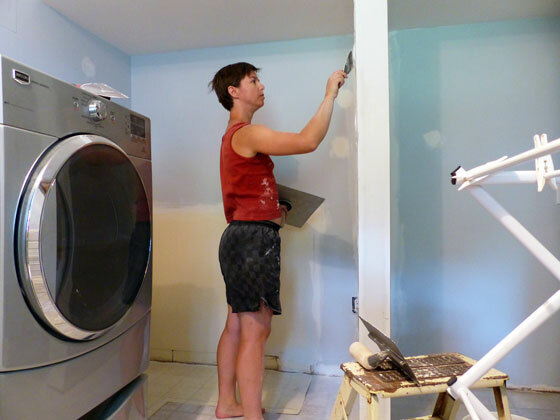 Therefore, the drywall and sanding stage take a long time. Even though we’re only working in the basement right now, dust is everywhere. Good news, you can slide around easily on the floors upstairs which makes getting around quick. Bad news, don’t set your black clothes down anywhere, or else you’ll have to choose a new outfit. We’re not pros, so there tend to be a few more bumps and ridges that we have to sand out… meaning more time, more sore muscles, more dust. Matt uses the pole sander, but I have never been able to master it. I also feel like I get a better finish by hand. So that means I get up close and personal with every single square centimetre of drywall. It’s a good look, wouldn’t you say? The good news is that the basement is looking really good. We’re at the third (and final) coat of paste pretty much everywhere, and a few spots need only touch-ups. If we can keep up the momentum, I’m anticipating being covered in paint spatters instead of drywall dust in just a few weeks. That will be a nice change of style. I’m ready for a makeover.